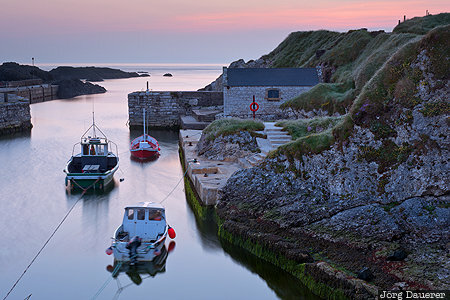 Blue Hour an Ballintoy Harbour with a colorful sunrise sky in the background and small boats in the foreground. Ballintoy Harbour featured in Game of Thrones Season 2 as the place where Theon Greyjoy arrives back in the Iron Islands. Ballintoy is in Northern Ireland, United Kingdom. This photo was taken in the morning of a sunny day in June of 2016. This photo was taken with a digital camera.